Figure 5-55.--Tiltable blade metal-cutting bandsaw. bandsaw depends upon the careful choice of a blade. number of teeth to be in contact with the material. pressure is required to force them into the material. clearance, the saw band will bind in the kerf. 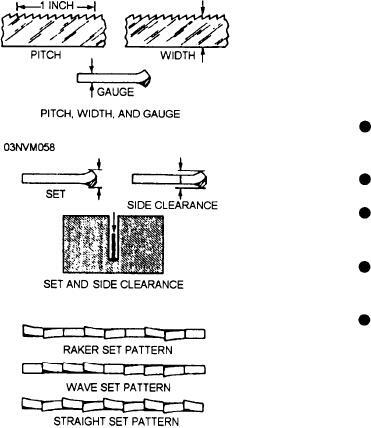 which are illustrated in figure 5-58.
pattern is not used to any great extent to cut metal. chapter is the pedestal grinder. A mounting base for the motor. wheel as a safety feature.